The 73th edition of the Vuelta a Espana 2018 will start in just a few days. Saturday 25 of August the riders will kick off stage one with an individual time trial through the old centre of Málaga. After this, the peloton will ride through Spain in some sort of a ‘’S-shape’’ for a total of three weeks. During the race the riders will encounter multiple cities including Marbella, Mijas, Linares, Mombuey and Torrelavega. 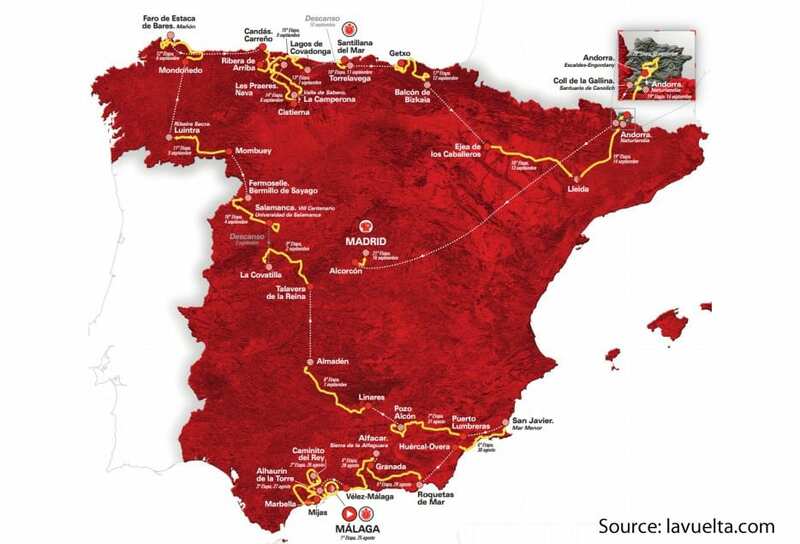 The Vuelta a Espana will finish Sunday 16 September during a traditional last parcours to the finish in Madrid. In this article I will tell you some more about the Vuelta 2018 and I will share some of my betting tips for this year. The Vuelta a Espana will start in Málaga (the south of Spain) and it will finish three weeks later in Madrid (the centre of Spain. During the parcours the riders will first go to the east of Spain (San Javier) to continue there journey to the north (Mondonedo). After this the peloton will travel all the way east to Andorra. The last stage will start just outside of Madrid in a small place called Alcorcon and it will finish in the centre of Madrid. During the Vuelta 2018 the riders will ride a total of 3.271,4 kilometres in a total of 21 stages. These stages consist out of two individual time trials, four flat stages, some intermediate stages, six stages with hills and a total of six mountain stages. During the whole Vuelta the riders will enjoy two rest days. In the image below you will see how the riders will travel through Spain. Many people love to bet on the outcome of the Vuelta a Espana, and that’s why we present you the most important odds for the general classification. This year Richie Porte, Simon Yates and Nairo Quintana are the riders with the best odds. In addition to this bookmakers also see Alejandro Valverde, Miguel Angel Lopez, Fabio Aru and Rigoberto Uran and Mikel Landa as important contenders. Richie Porte is one of the most called names for the end victory in the Vuelta a Espana 2018. So why not place a bet on him? Although Porte is one of the most unlucky riders ever and still busy coming back from a heavy injury we expect him to do very well. Because of this the 3.50 odd might be fairly interesting. If Richie Porte is unlucky again, or still has problems with his injury, his top spot might be taken by one of the other top contenders for the general classification including Simon Yates and Nairo Quintana. Simon Yates contended in the Giro d’Italia this year in which he won three stages, which shows he is in good shape. Because of this the 4.00 odds might be worth the shot. On top of this Quintana won a very heave mountain stage in the Tour de France which shows he is still very dangerous in mountainous terrain. This makes Quintana, with a very interesting 8/1 quote, a fairly interesting rider to bet on. Besides these big names I also want to mention some less recommended riders which might be interesting to place a small bet on. First off all Wilco Kelderman will make its comeback during the Vuelta a Espana after a shoulder injury which made him unable to ride the Tour the France. At most bookmakers Kelderman gets odds of +/- 29.00 which could be very lucrative. One other rider that could surprise people in my opinion is Vincenzo Nibali. If he has a good three weeks he could be interesting for the top spots especially with odds of +/- 29.00. One last tip is Steven Kruijswijk. Kruijswijk could be a very good outsider after a very strong performance (fifth in general classification) during the Tour de France. Odds for Steven Kruijswijk average around 40.00. If you enjoy to watch the Vuelta a Espana then it might be fun to raise the excitement by placing some bets. At the moment you can for example bet on who will win a certain stage of the general classification. On top of this you will be able to bet on winners of points and mountains classification. If you predict the outcome right you can win a lot of money. In the table below you will find a selection of reliable bookmakers that offer odds for all major cycling events including the Tour de France, the Vuelta a España and the Giro d’Italia. Open your free account today and collect bonuses and free bets by making a first deposit. During the 2018 edition of the Vuelta a Espana many big names will compete for the victory in the general classification. A few important for the end victory are Bauke Mollema, Richie Porte, Nairo Quintana, Vincenzo Nibali, Fabio Aru, Simon Yates and Rigoberto Uran. 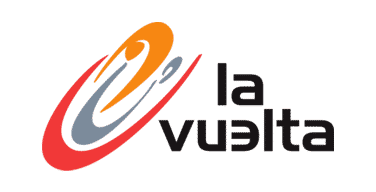 Below you will find a full overview of all the expected / confirmed riders and team for the Vuelta 2018. In total 18 different World Tour Team will compete during the Vualta 2018. During the Vuelta a Espana also riders from four procontinental teams will compete.